When I was in highschool I decided for the second time that I wanted to be a doctor. You see, I had always wanted to become a doctor since I was little girl, but I had this tiny lapse in judgement when I was about 16, and thought I could be a singer instead. What can I say, I was 16 and wooed by the prospect of traveling the world and performing for millions of people and being a celebrity. I told my parents, thinking they wouldn’t be happy about it and that they would try to stop me (as most teenagers do…lol, if there are any teens reading this, just know. your parents are right about everything). My mom told me to go for my dreams, and if I wanted to be a singer, that I should do it. She said that she always liked my voice (I sing literally 80% of the time. Just for no reason. I’m not too bad I’m told) and if I wanted to, could do anything. My dad echoed the same sentiments. And with stars in my eyes for my new found dream and my parents behind me 100%, I worked at it….for approximately 1 month. A couple of situations happened, where I found out, I’m no singer. One day, I’ll tell you all the story. Anyway, I came to my senses after I realized I had stage fright, and no business being on stage. Not in that manner at least. I went back to my original (and truest, most sincere) dream of being a doctor after I let go of the frivolous stuff. I decided that I, myself could do way more good as a doctor. And my love and ambition and drive to become a doctor one day in the distant future was back. Looking at it now, I suppose my heart wasn’t really in the singing thing. Not because I failed (miserably) at it. No, failure means nothing in that regard because honestly I’ve fallen on my face many times in this journey to my MD thus far and I don’t consider any of those road blocks as a definitive ‘L’. I lost, and got up to ‘play’ again. Every time. It wasn’t always easy, but I never let my MD dreams die. And I never, ever will. The thing with singing was that I failed, and had no issue letting go and moving on. All the times something went wrong with school, I had my moment (if even that) and then got back to business. So that was one big lesson for me. People always put in work for what really matters to them. But what about when the plan doesn’t go as planned? I’m a planner. Always have been, always will be (chalk it up to being a September baby). I like order and organization and when things go exactly as I planned them. But sometimes no matter how fool-proof your plan seems, God has different plans. I learned this the hard way when my grades didn’t put me where I thought they would. There are many rivers that lead to the same ocean. Just a fancy way of saying there is never one way to do something or get somewhere. Perhaps one of the most important lessons I learned. Yes, plans are good, and it’s smart to be organized and have your mind set on your goal and your steps to reach that goal. 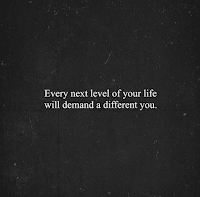 But don’t be so set on your plan that you can’t be flexible. Along with my self-diagnosed OCD organization came this stubborn belief that the plan was perfect. Apparently the plan was not perfect. Not for me. It was a good plan, but I don’t think it was meant for me. Want to hear this perfect plan?? I was going to go and spend 4 years on my undergrad in Nursing and then go to a Canadian medical school. I wanted to go to McMaster. Good school, good reputation. I was good at science and I just knew this was all I needed. I had classmates in my year who also wanted to be doctors, and some had planned to go away to med school. I thought this, and even said it out loud. Not because I didn’t believe it would work, but because I liked being at home. Even my two best friends were making plans about living together at some point after highschool. and I said again..
Nope, not me. I’m staying home. My parents are there. I’m not ready to be on my own yet, not even for school. I am staying HOME and trying to stay with my parents as long as possible. The world is harsh and when I move out, I’m not moving home again. When I move out, it’s for good. You know, I thought I was being level headed and smart. Saving money. Doing it the right way. I should mention that I haven’t actually lived at home since I started college, one year after I graduated high school. See how things can change? The plan wasn’t going to work for me, had to find another way. And that was my first lesson. And when I realized that there are many rivers, I learned something about myself. I’m braver than I thought because I was willing to explore the other avenues even though they were scary. Ah, the relentless and stubborn attitude comes in handy now. The girl who didn’t want to leave home found herself moving to the Caribbean. All by herself. Just to follow that dream. Nothing was stopping me. Not even my own fear. I didn’t care how hard it would be, I was going to make it. Still am. Never been afraid of hard work. Sometimes the plan doesn’t work out, but everything happens for a reason. My resolve to become a doctor never changed, no matter how many doors were slammed in my face. And it was quite a few doors too. One thing was for sure though, each time taught me something essential to becoming who I am today. Every closed door was an opportunity for me to learn something I wouldn’t have if I just had it easy. I didn’t always see it at the time, but when I stand back and look, I can see it now. Of course I have always had so much support as well. My parents always there with their encouraging words and little band-aids for every time my fingers got slammed in that proverbial door. The siblings who I know are so proud of me even when we’re not getting along too well as siblings often don’t. All my aunties and uncles, and cousins cheering me on. My friends who stay my friends even though I’m crazy obsessed with studying sometimes and almost never get out to chill with them. They come get me and make sure I don’t stay under the med school rock too long. So many people are wishing me well. I’m nothing if I don’t see, recognize, acknowledge and appreciate the blessings I was lucky enough to be immersed in from the day I was born. My eyes were not always this open. But at a certain point I stopped saying “why me.” and started saying “TRY me.” Like, what other thing is going to try and stop me. Bring it on. LOL. I’m not sure when, but I definitely grew to think this way. I’m still learning. 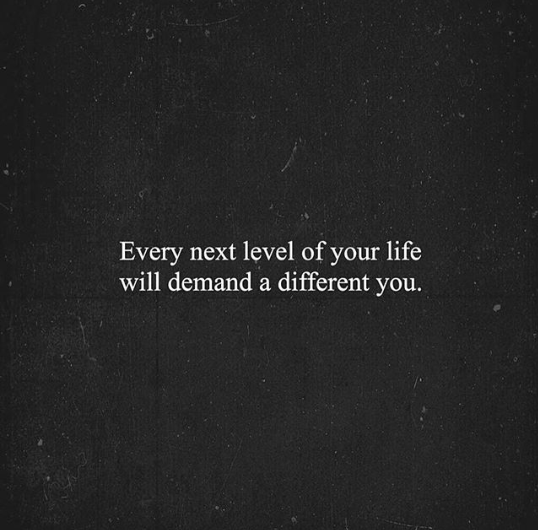 Even now, and in the future. I know it won’t be easy, but I try to stay positive. Things happen, and sometimes life gives you a crappy hand to play. Sometimes the plan doesn’t work (even when you worked so hard on it, and love it to pieces). Focus on the good and be relentless with the end point, not the steps required to reach it. 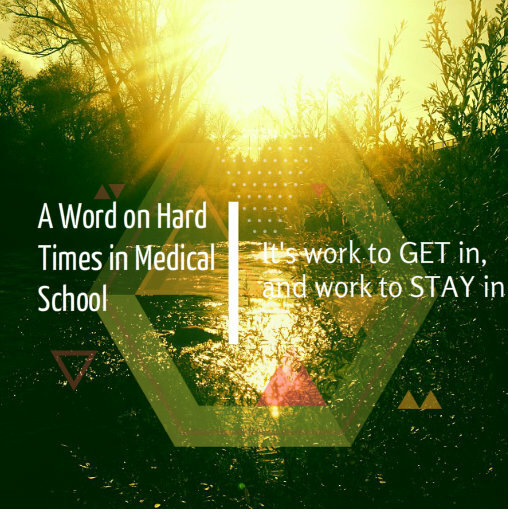 Medical school is work to get in and work to stay in. Everyone has their own way of dealing with problems when they come. Any comments or good tips on how to deal?